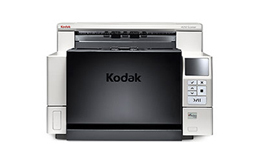 The Kodak i4650 Scanner is a perfect fit for medium & large size scanning departments and regional offices. With a daily volume of up to 75,000 pages per day, digitizing and managing a whirlwind of documents just got easier. The i4650 is Kodak's most versatile capture solution, so you'll be ready for production scanning the day you open the box. Kodak took everything they've ever learned about document management and built an entirely original platform to help you control information, automate processes and take productivity to new heights. The i4650 is a 130 ppm Duplex (Landscape, Scanning in Bitonal/ Grayscale/Color) production color scanner with a 500 page Automatic Document Feeder and advanced image processing features. The i4650 scanner comes equipped with a document printer; however, to utilize the printer, you will need to purchase and install the Enhanced Printer Accessory. Maintains full rated speed with valuable features like Auto Orientation, Auto Crop, and Skew Detection enabled. SurePath Paper Handling delivers advanced feeding and stacking functions for increased performance and reduced prep time. Meets real-world needs with virtually jamfree operation for practically any document in any condition. Physical dimensions 13.7 x 19.2 x 18.4 "
ADF Feeder Paper Size Min. - W x L 2.5 x 2.5 "
ADF Feeder Paper Size Max. - W x L 12 x 210 "
Care Kit, Group DX Capture Pro Software 3 Yr.
Care Kit, Group DX Capture Pro Software 2 Yr.
Care Kit, Group DX Capture Pro Software 1 Yr.